The rundown: I’m excited to have, for the first time, seen all nine of the finalists that were announced in mid-December. I’ll run through each and the country statistics below. I’m predicting the exact Critics’ Choice list, which includes the four eligible Globe nominees (“Girl” from Belgium didn’t make this shortlist). 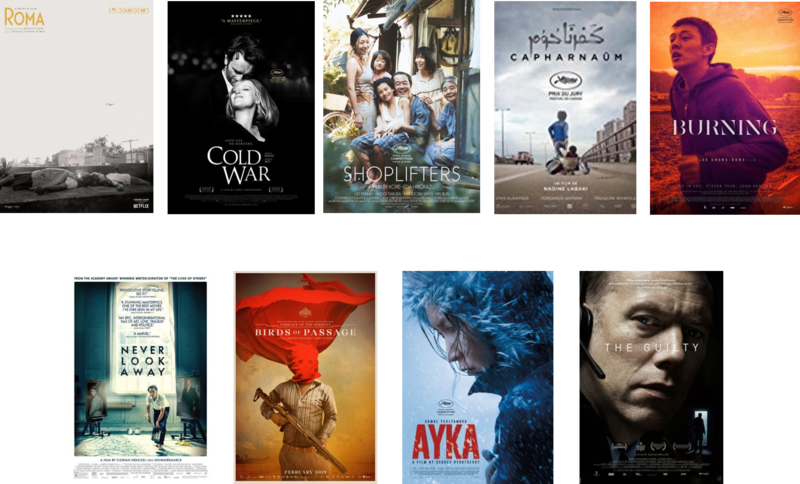 There’s no question that Roma (Mexico) will be nominated here, since it’s expected to win Best Picture yet still cited by most organizations as the Best Foreign Film of the year. Director Alfonso Cuaron won an Oscar in 2013 for “Gravity,” but this would be his first nomination in this category. Mexico has been nominated eight times before, most recently in 2010 for “Biutiful,” and has yet to win. It might be foolhardy to put Cold War (Poland) down as a lock after it was snubbed by the Golden Globes, but director Pawel Pawlikowski’s previous film, “Ida,” won this award in 2014, and the film has won many critics’ prizes. It is also a likely nominee for Best Cinematography. Poland has been nominated ten times before, with “Ida” marking its first win. Shoplifters (Japan) seems like a sure thing. It would mark the first nomination for director Hirokazu Koreeda, his thirteenth feature film. Japan has been nominated fifteen times before, winning three honorary prizes in the 1950s and then for “Departures” in 2008, its last nomination to date. Capernaum (Lebanon) was an early festival favorite and would mark only the second-ever nomination for Lebanon, which earned its very first bid last year. Though director Nadine Labaki has made two acclaimed films before, this would mark her first nomination. Burning (South Korea) has taken home some prominent critics’ prizes in addition to earning a nomination from the Critics’ Choice Awards and a spot on the National Board of Review’s list. It also has a dark horse acting contender in the form of Steven Yeun, which might give it more visibility. Despite thirty previous submissions, this would mark the very first Oscar nomination for South Korea. This is director Chang-dong Lee’s sixth film. Never Look Away (Germany) was nominated for a Golden Globe, and its best asset is the fact that it comes from director Florian Henckel von Donnersmarck, whose first film, “The Lives of Others,” won this award back in 2006, affording Germany its most recent of three wins. The country has been nominated a total of nineteen times. Birds of Passage (Colombia) hasn’t won or been nominated for any non-festival American prizes, though the same was mostly true for “Embrace of the Serpent,” the last and only time Colombia was nominated for an Oscar, a film from the same filmmakers, real-life couple Cristina Gallego and Ciro Guerra, as this one. Ayka (Kazakhstan) was the big surprise finalist among this group, and could earn its country its second-ever Oscar nomination after its 2007 bid for “Mongol.” This film won a Best Actress award for star Samal Yeslyamova at the Cannes Film Festival. This is director Sergei Dvortsevoy’s second feature film. The Guilty (Denmark) won an Audience Award at Sundance and was one of the National Board of Review’s choices for foreign film. This is director Gustav Möller’s debut film. Denmark has thirteen previous nominations and three wins, most recently for the superb “In a Better World” in 2010. Forecasted winner: Unless voters feel Roma is going to be rewarded elsewhere and give this to “Cold War,” there won’t be any surprises here.